Home » Podcasts » Techzim Podcast: Interview with Mazwi – Could it be Zimbabwe’s Amazon? Techzim Podcast: Interview with Mazwi – Could it be Zimbabwe’s Amazon? The last time we wrote about local startup Mazwi, they were clearing misconceptions around EcoSchool’s alleged “theft” of their concept. They went to great lengths to explain how they had a different model from what Econet was driving at. Months later, we managed to catch up with Tafadzwa Makura, the founder of Mazwi to find out how their business model has been faring. In this chat he brought us up to speed about the traction they have managed to gain over the past months and the problems that they are trying to solve by being an online publishing platform that makes the distribution of books in a digital format more widespread. One of these problems that they have managed to tackle for writers and content creators is the piracy hacking at the local publishing industry. Writers have constantly complained about the illegal distribution of their work which doesn’t offer any return for their efforts. Some writers are actually contemplating leaving the profession altogether. An opportunity however lies in online publishing and distribution. Through platforms like Mazwi the writers will get to enjoy returns for each book sold while avoiding the high costs of publishing that have made the distribution of books very expensive. Thanks to an integration with local payment gateway Paynow, the process of buying any of the several titles that are available on Mazwi has been made a whole lot simpler for anyone local or abroad. 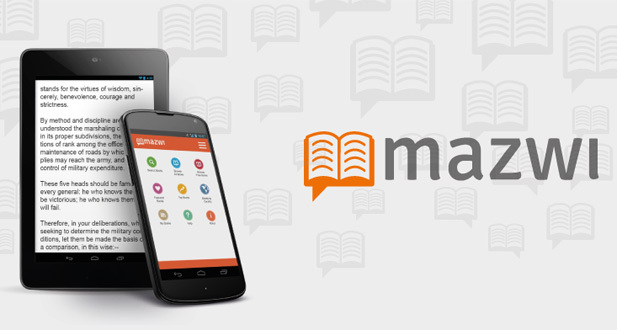 With an easy to use platform, diverse content (a lot of writers have resorted to pushing their books there) and the payment issue tackled, it’s easy to view Mazwi as the one platform that could become our own Amazon. Mazwi essentially provides a place where content creators can distribute their work at a fraction of the cost. This is the model that Amazon has perfected, albeit with a focus that extends beyond books. With the right support on a large scale from publishers and writers perhaps Mazwi can become the lead distributor of content. This is of course, assuming that EcoSchool doesn’t get into that business first. What are your views on the issues surrounding piracy? How else do you think that tech and the internet can provide salvation. Your comments on this issue are welcome below. I really like the Mazwi site, it looks good, is well made and worked well when I made my purchase, def a step above most other startups ive used recently well done to them, something to be proud of and good luck to them.